As the title suggests, I will help you install your decompiled robot via remote desktop service, teamviewer. 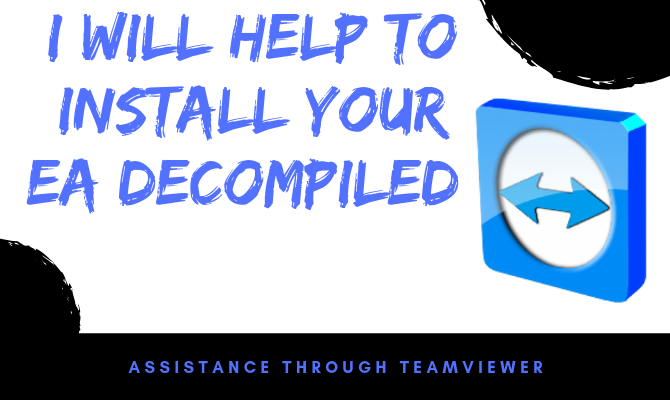 Wrapped after you decompile a file, you have problems with the installation, I will help you and show you how to use it without problems. I will use teamviewer to do this. You can order my service by sending me your Data teamviewer. Customer ID and Password. I will try to provide fast solutions to your problem and solve any questions you got. What are you waiting for? Contact me now and we will decide the exact time to better assist you with the installation of your Expert Advisor. Finally, I offer any remote assistance. Just contact me and let me know your problem. Support type: Teamviewer or any other available online supporting tools. Please contact me before placing an order.